Some clever video game spelunkers recently uncovered a pair of easter eggs hidden away in LEGO Dimensions. Apparently, LEGO exhumed and then dusted off the long-dormant, classically beloved (not to mention chronologically opposed) cartoons The Flintstones and The Jetsons. Not that Batman, Gandalf, and crew can actually go kick it with Fred or George, but you can break into their houses and smash all of their furniture! If you want to bounce on over to Bedrock, or Future Earth or whatever the Jetson family calls their domicile in the sky, it'll cost you. You'll need help from inter-dimension being The Doctor, and also, for some reason, the Simpsons. Video games are weird. 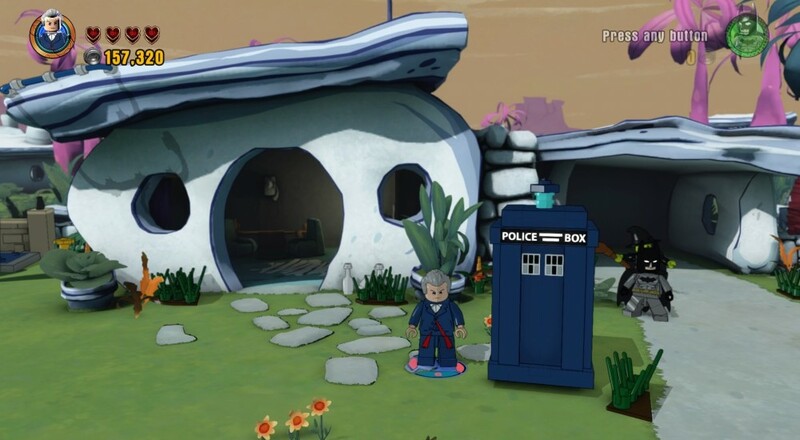 Both the Dr. Who pack and The Simpsons pack must be purchased separately before you can jump into the game's more secret areas. Let me be real with you guys for a minute: I've got no problem with classic cartoons. But, is The Jetsons a hot commodity? Is anybody seeing this and saying "Oh man, I've gotta take Batman to Fred Flintstone's place so I can break all his stuff!" I can't imagine the kids get ultra-pumped when they see these locations. Maybe a parent-child combo can bond by the elder one regaling their spawn of the innumerable tales of George Jetson screwing up. Maybe the LEGO Dimensions team thought it would appeal to fans of the 2015 film, The Flintstones & WWE: Stone Age SmackDown!. Yes, that is a real movie that came out this year. No, I have no idea what's going on anymore. Page created in 0.5226 seconds.